Great news! 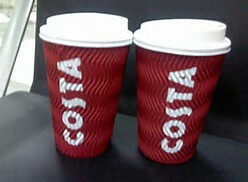 From today, we can recycle Costa and Starbucks takeaway coffee cups! Millions of paper cups will avoid landfill sites or incinerators under a new service. Furthermore, employers will be encouraged to install dedicated bins in offices and factories and every workplace, so that cups can be sent to specialist centres for recycling. About 7 million throwaway cups are used in the UK every day, and that's 2.5 billion a year, which means vast numbers are simply dumped in landfill or burnt. 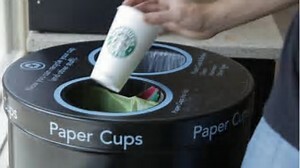 But now, waste company Veolla, working with coffee chains Costa and Starbucks will have a recycling service. Most disposable cups from high street cafes could not be recycled up until now because they have a plastic coating. But Veollla will ship them under a new system to a specialist plant. However, green campaigners say that the only real solution is to develop a cup that can be recycled along with normal paper, rather than setting up a new system. I say, in response, at least this is a start! Let's hope that people are willing to recycle their coffee cup and dispose of it in the right bin. It all sounds very easy so let's do it from today!